Note: A more recent post comparing my projections for EV growth with others is here. 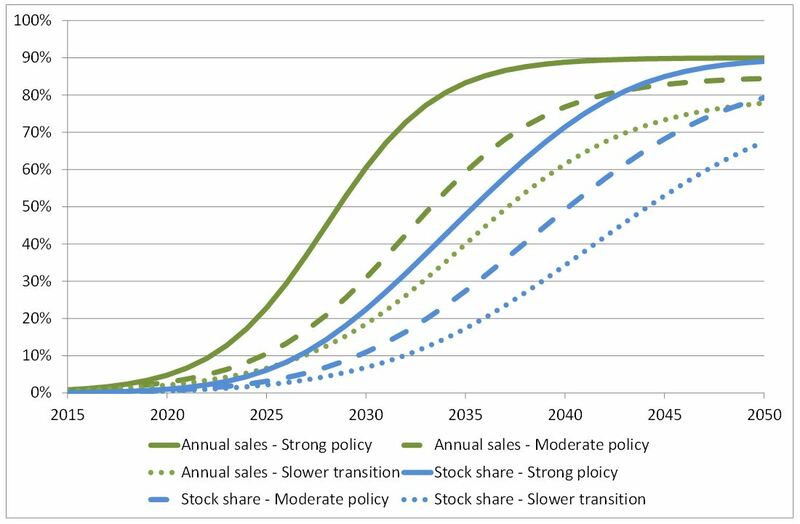 BP’s 2016 long term scenarios showed electric vehicles (pure EVs and plug-in hybrids) making almost no difference to the transport sector until beyond 2035. t is easy – and perhaps accurate – to dismiss this view simply as an incumbent not facing up to the effects of a disruptive new technology, the equivalent of a silent movie producer suggesting in the late 1920s that talking pictures were a merely a fad which would never catch on. I So how fast might the market for plug-in vehicles grow if policy drivers are strong and matched by favourable economics? I now consider how quickly electric vehicles could gain market share on that sort of optimistic view.